Boy, the letter “I” was a hard challenge! I finally decided my “I” was going to be “ice” or “icicle,” but I didn’t know what I was going to do with that. It got down to this weekend when I was working at Vogue Knitting Live and found a beautiful silk/cashmere beaded yarn. The silver lined beads on the creamy yarn really made me think of ice. With only 200 yards of yarn, I need to find just the right project. I thought a lace cowl was the way to go. I knit all day yesterday and am about half done. 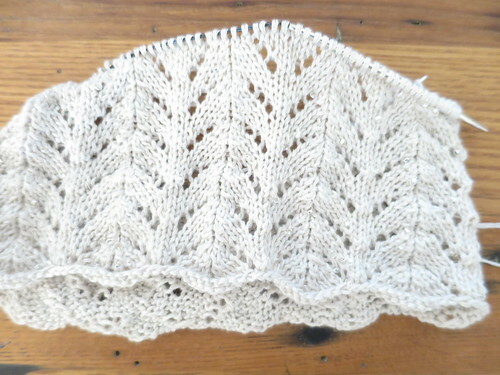 The pattern, Lace Cowl, is free from Wendy Dayus. It is a simple six row repeat, which I had memorized after knitting it once. I think it works really well with the yarn. 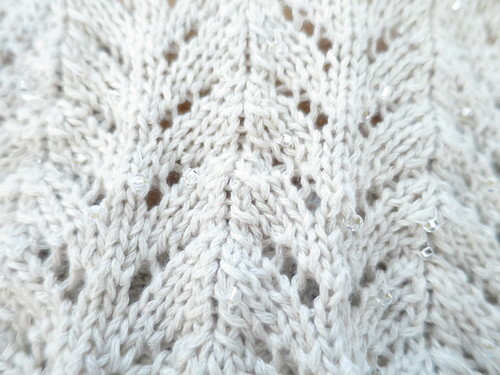 The cowl is so soft with a nice drape and the beads just catch the light, like ice! You can see the beads a little better in this close up. It took be a bit to figure out how to make sure the beads are in the front, but I’ve got it down now. This is such a quick knit, I’ll probably have it done before the new president is declared tonight. 2 years ago by Kat in Challenges , Crafts , Iron Craft , Knitting , Needlecraft | You can follow any responses to this entry through the RSS feed. You can leave a response, or trackback from your own site.